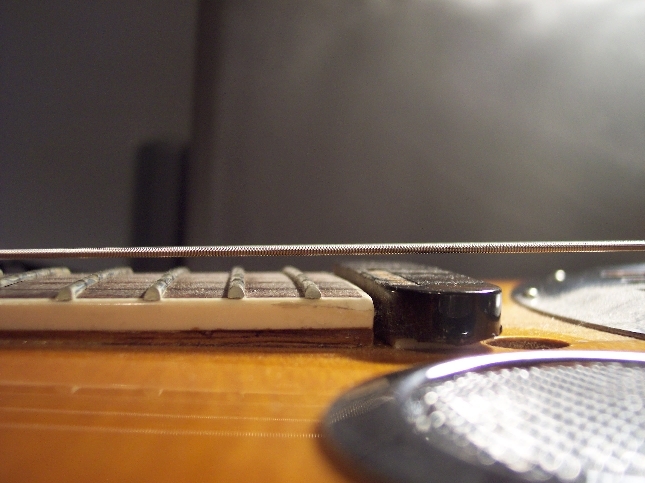 Sebastian from England asked a question about pickup loudness that called for a close-up photo of the pickup and the distance between it and the strings. 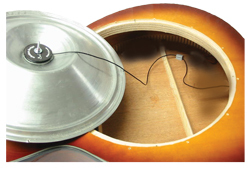 If the audio output of your Sensor pickup is on the weak side, check the distance against my "roundneck" resonator below, which turned out to be the thickness of three US pennies at the high 'e' string (sorry guys, I don't have UK nor Australian coinage) or 0.18 inches (about 4.5mm). See photo below. I also checked the resistance of the pickup: 3940 ohms. 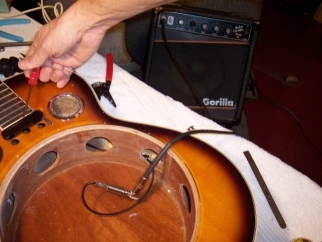 If you read a value 50% higher or lower you may have a bad pickup or a bad cable between the jack and the pickup. 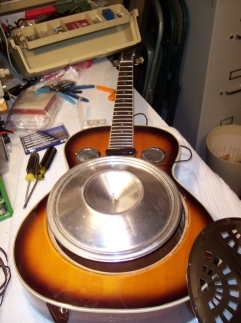 If you are installing your pickup on a "squareneck" resonator you'll need to place shims behind it to move the pickup closer to the strings. This idea looks interesting enough that if I had to do it over again I would consider trying it. 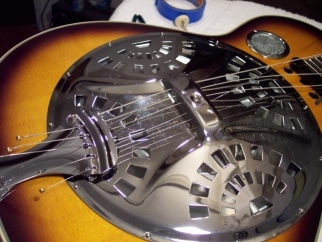 As I wrote to John the problem with a magnetic string-based pickup is that it can't pick up the acoustic sound coming from the spider and cone, which is of course much of what gives a resonator such a distinctive sound. 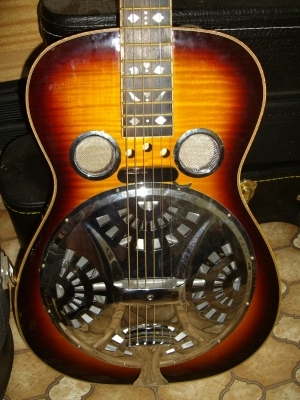 The Schatten pickup appears to be the next best thing to playing a resonator into a microphone. Here are two pictures sent to me by Paul from Australia. 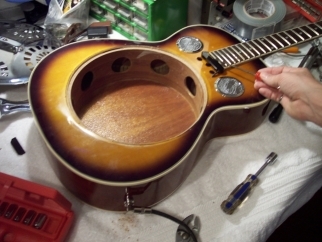 Paul shows the results of his Lace pickup installation in an Oakridge 'reso'. Thanks and g'day, Paul! Note: This was a one-off recording. If I had infinite time I would fix it up. But I'm done with this project NOW! The notion of using both mic and pickup during a live performance is interesting though.... Sounds nifty to me. Maybe use a stereo connection... Hmmm. One last note: it actually took longer to create the web pages than it did to make the conversion! I bought a Lace "Sensor" pickup in August, 2007. 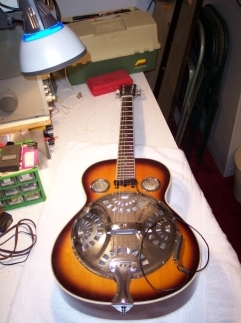 After months of working up the courage to install it and also obtaining advice from Dalton Coffey I finally got around to installing it on my Flinthill resonator ("Dobro") guitar today, which happens to be my mom's birthday, April 10, 2008. 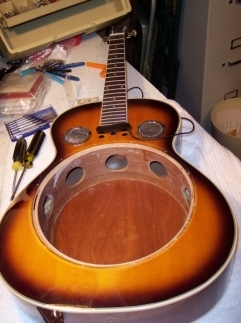 I had put up with the problems of an "outboard" pickup that wasn't secured to the body of the guitar for several gigs before deciding to (take a deep breath) make it part of the guitar. In case you want to try this yourself I took photos along the way so you can see how it was done. The entire project including the time to snap the photos took less than two hours (much to my surprise!). You can expand some of the photos by clicking on them to see larger versions. Back to my home page. 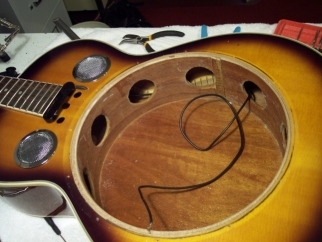 The the bottom of the neck seemed to me to be the best place to install the pickup. 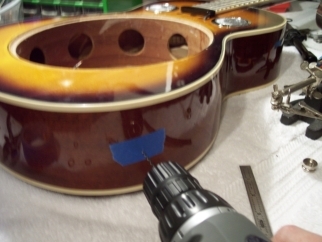 The starting point: the Lace Sensor pickup attached at the bottom of the neck using the double-sided tape supplied by Lace. 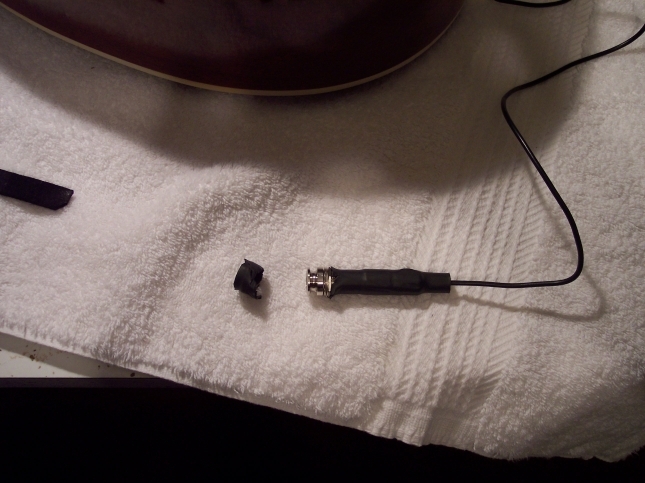 The outboard nature of the pickup left it precariously attached by the audio cable - just waiting to be pulled loose from the guitar should someone trip over the cable or any number of potential disasters. 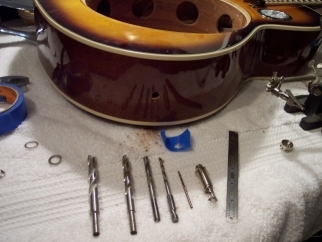 Step 3: Using a jeweler's screwdriver remove the 12 screws holding cover plate . 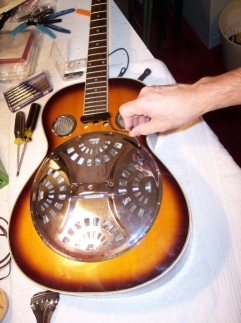 Step 4: Remove the cover plate, exposing the spider/sounder (pie tin). Back side of sounder (pie tin) just to show what it looks like. 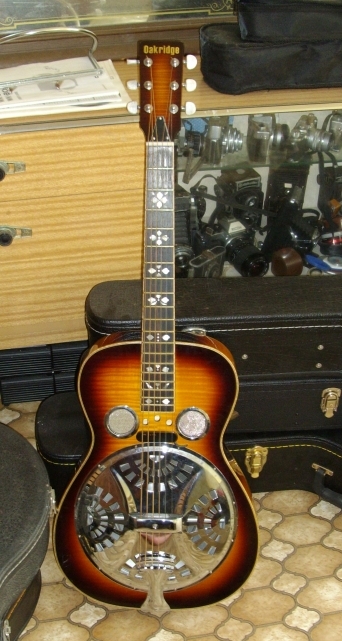 View of resonator with sounder removed. 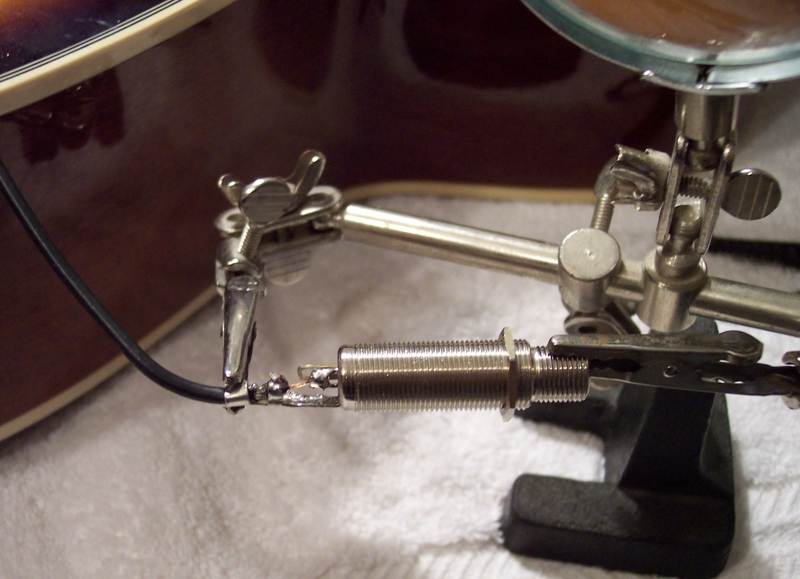 Step 5: The jack supplied by Lace has heat-shrink tubing covering its assembly (top photo). Remove the heat-shrink by snipping it away and peeling it back, then unscrew the connector shell (lower photo). 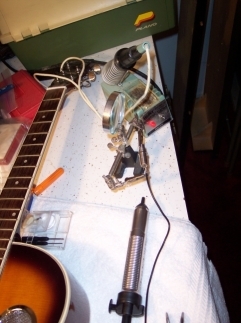 Step 6: Desolder the jack from the audio cable so you can route the cable inside the body of the guitar. 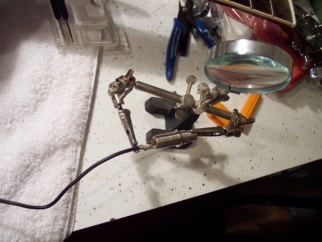 view of soldering iron (top), jack assembly (middle) and solder sucker (bottom) for reference. 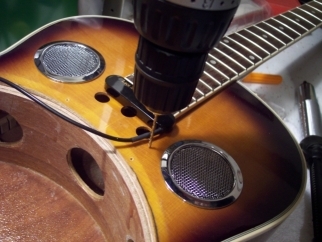 Step 7: Drill pilot hole (I used 1/16") to start the routing of the audio cable. 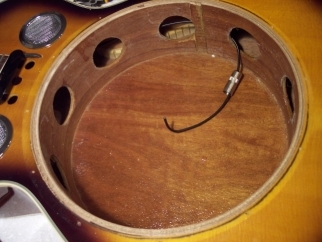 I chose not to route the audio cable through one of the three sound holes but there's no reason that wouldn't also work. Step 8: Use a drill bit a size or two up from 1/16" to widen the hole. Skip ahead one step to see the tape I should have used from the start. Step 9: The cable measures .140" diameter. I used a 5/32" (.156") bit to make the final hole for the cable. Step 10: Route the cable through the hole you just drilled, and then gauge the length by running it through the hole nearest the place where you want to install the jack. 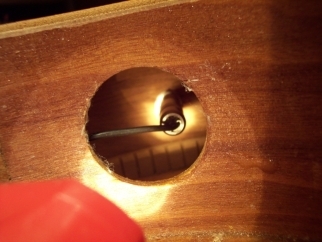 Step 11: Route the cable through the hole nearest the point where you want to install the jack and cut it. Leave the damn connector shell on the cable - just in case you might forget it (voice of experience here). Step 12: Strip the cable sleeving using the appropriate size of stripping tool. I used the "AWG 12" size of a Radio Shack stripping tool. But whatever works... Just make sure you don't strip away the shield braid. Close-up view of stripped audio cable. 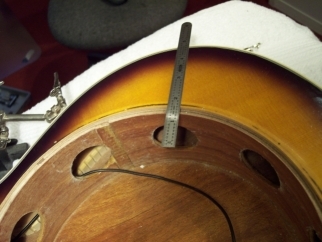 Step 13: Choose the sound hole nearest the point where you want the jack to be installed. 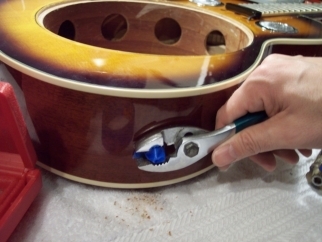 Step 14: Apply tape to prevent chipping the finish, then drill a small pilot hole. Step 15: Use a series of drill bits to gradually increase the hole size to 3/8", then remove the tape. 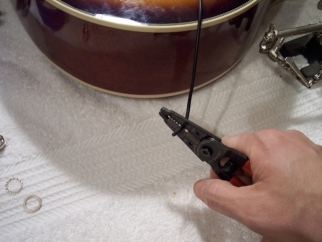 Step 16: Resolder the jack onto the end of the audio cable. 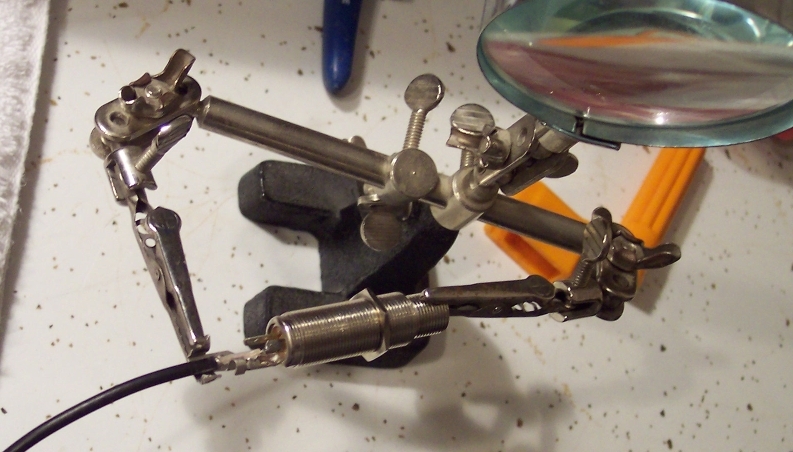 While hard to see in the large version of the photo (click on the image) there is a U-shaped part of the connector that may have been intended to provide mechanical support by gripping the cable. A better view of the "U" is shown in the large image from Step 6. For simplicity and to keep my soldering iron away from the center conductor and its insulation I wrapped the braid around the "U" and soldered it there. 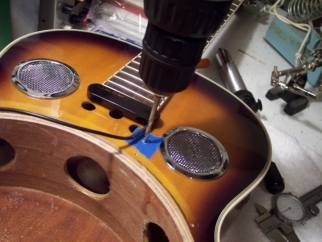 Since the pickup cable will now reside inside the guitar there is little need for the connector to grip the cable. 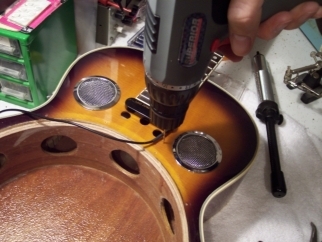 Step 17: After soldering the trimmed audio cable onto the connector, plug in an amplifier and use a screwdriver or other magnetic object to "tap test' the pickup by tapping the metal end onto the pickup and listening to the result on a guitar amplifier. 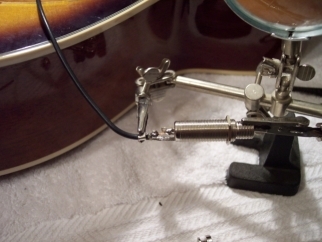 Since there are no strings, a "tap test" is a good indicator that the connection is good (not open or shorted). 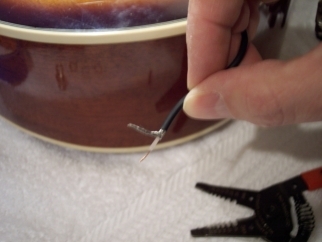 If you don't hear a tap from the amp check your soldering and inspect the cable for possible damage. Step 18: Reassemble the connector (you did make sure you left the connector shell in place, right?) and secure by tightening. 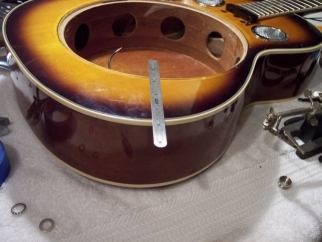 Step 19: Insert jack through the hole you made in the body of the guitar and secure with a nut driver. 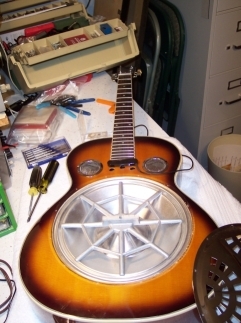 Update (2009): After using the resonator for over a year I now wish I had installed some sort of plate or wide washer behind the jack on the inside. 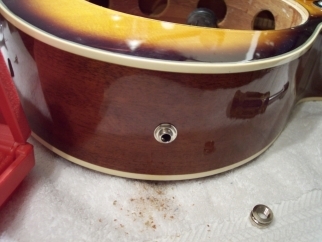 After repeated plugging and unplugging the connector is a little loose and since it is held only by the thickness of the wood I can foresee and accidental yank on the cord tearing the jack right out of the body of the guitar. 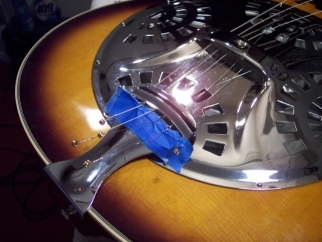 The next time I change strings I may open this up again and install something to reinforce it. In the mean time, I'll just have to be careful. Consider adding this if you can. Outer view of connector jack with nut attached. The collar is shown on the lower right. Step 20: Hand-tighten the collar then wrap wrap it with tape to prevent nicking. 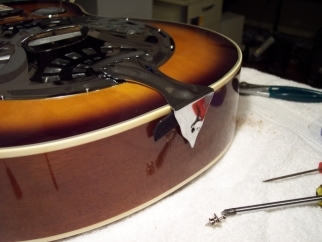 Tighten with pliers. 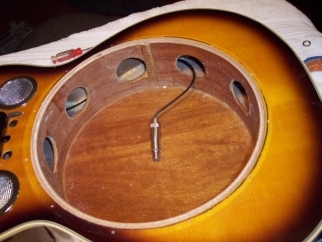 Step 23: Reassemble the cover plate and the string bracket, but don't forget to insert the felt pad - shown above, partially inserted to show where it goes. 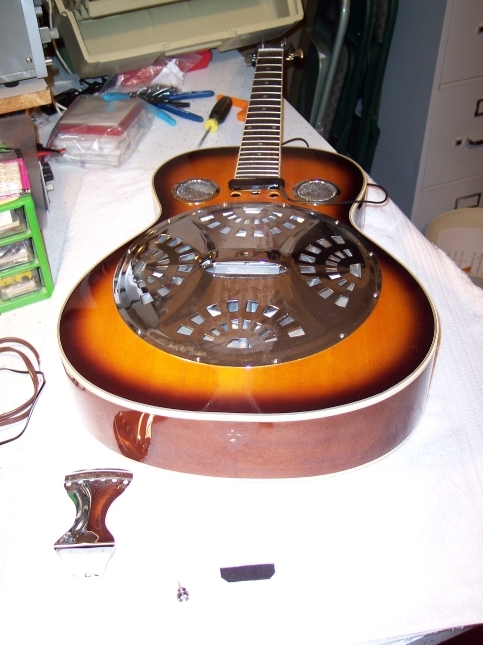 Step 24: Install the new strings. BUT MAKE SURE YOU ROUTE THEM UNDER THE STRAP OF THE COVER PLATE! See above. 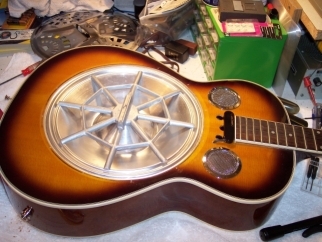 Not being hugely familiar with "resonator" guitars, I almost missed this. I used a piece of painter's tape to keep the ball ends from slipping through the keyholes while stringing the free ends. 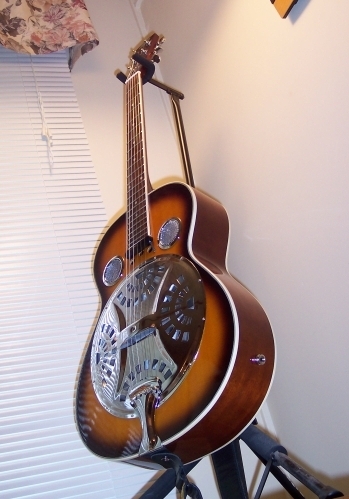 In retrospect, I think a capo on the first fret with all strings snugly in position would have worked as well or better. Write me if you have a better solution. 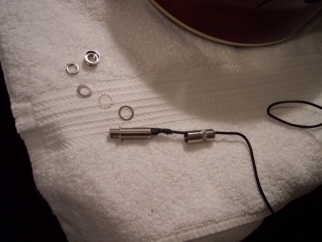 Step 24: The final result: A resonator with a built-in connector jack! !